Carson Fulmer – RHP – Vanderbilt. 8IP 5H 0R 0ER 3BB 12K. (W, 4-1). Trey Killian – RHP – Arkansas. 5IP 6H 5R 5ER 4BB 6K. (L, 0-2). Trey Wingenter – RHP – Auburn. 2IP 1H 0R 0ER 2BB 3K. Grayson Long – RHP – Texas A&M. 5IP 5H 3R 3ER 2BB 7K. Logan Shore – RHP – Florida. 9IP 10H 1R 1ER 1BB 8K. (W, 4-2). Michael Matuella – RHP – Duke. 4.2IP 5H 6R 2ER 5BB 6K. (L, 1-1). Kyle Funkhouser – RHP – Louisville. 7IP 4H 1R 1ER 2BB 7K. (W, 3-2). Trent Thornton – RHP – UNC. 1IP 4H 3R 3ER 0BB 1K. (L, 1-2). Alex Bostic – LHP – Clemson. 0.2IP 1H 2R 0ER 1BB 1K. Zach Burdi – RHP – Louisville. 1.2IP 1H 0R 0ER 1BB 1K. (S, 2). James Kaprielian – RHP – UCLA. 8IP 4H 3R 3ER 1BB 9K. (W, 5-1). Brett Hanewich – RHP – Stanford. 5IP 8H 4R 4ER 4BB 0K. Bobby Dalbec – RHP – Arizona. 1.1IP 0H 0R 0ER 1BB 0K. (S, 5). Mitchell Traver – RHP – TCU. 6IP 4H 1R 1ER 3BB 5K. (W, 4-0). Trey Cobb – RHP – Oklahoma State. 4.1IP 4H 0R 0ER 1BB 3K. Parker French – RHP – Texas. 4.1IP 7H 3R 3ER 0BB 3K. (L, 2-2). Ryan Moseley – RHP – Texas Tech. 4.1IP 9H 4R 3ER 2BB 5K. Ben Meyer – RHP – Minnesota. 8.1IP 6H 3R 3ER 2BB 5K. (W, 1-3). Lance Thonvold – RHP – Minnesota. 0.2IP 0H 0R 0ER 0BB 2K. Chance Sinclair – RHP – Nebraska. 7.2IP 2H 1R 1ER 2BB 6K. (W, 4-3). 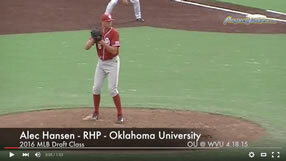 Josh Roeder – RHP – Nebraska. 1IP 1H 0R 0ER 0BB 1K. (S, 8). Patrick Weigel – RHP – Houston. 4.1IP 5H 2R 2ER 0BB 5K. Jimmy Herget – RHP – South Florida. 6IP 1H 0R 0ER 5BB 11K. (W, 5-1). Kevin McCanna – RHP – Rice. 7IP 7H 3R 3ER 0BB 8K. (W, 3-2). Thomas Eshelman – RHP – Cal State Fullerton. 8IP 9H 2R 2ER 0BB 5K. (W, 3-2). Dillon Tate – RHP – UC Santa Barbara. 9IP 3H 2R 0ER 1BB 10K. (L, 3-3). Joseph Shaw – RHP – Dallas Baptist. 6IP 6H 2R 2ER 3BB 4K. (W, 5-0). Colin Welmon – RHP – Loyola Marymount. 7IP 9H 5R 5ER 2BB 5K. Mike Murray – RHP – Florida Gulf Coast. 5.1IP 10H 6R 6ER 2BB 3K. (W, 3-3).